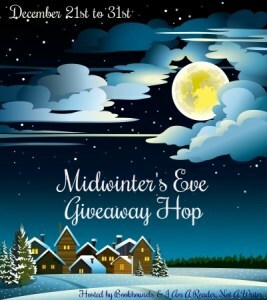 Welcome to the 2015 Midwinter’s Eve Giveaway Hop, hosted by I Am a Reader, Not a Writer and Bookhounds. Today is the shortest day of the year in the Northern hemisphere. And it’s also a Monday. Talk about a depressing combination! But this coming Friday is Christmas, so a lot of people will have a long weekend next weekend, whether they celebrate the holiday or not. That’s something to look forward to. And speaking of looking forward, starting tomorrow the days will begin getting longer again, just a little bit at a time. The very short days and long nights in January, especially after all the hustle and bustle of the holidays, made January (and February) particularly difficult when we lived in Anchorage. I usually tell people that we left because three Januarys was my limit. Five hours of daylight is just not enough. 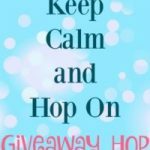 But for those planning to read the long nights away, this bloghop gives away oodles of bookish prizes. 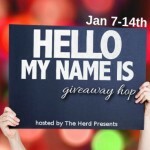 For my part, I’m giving away either a $10 Gift Card or a $10 Book to the lucky winner. 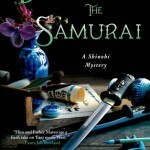 This is an international giveaway, the books can be sent anywhere that Book Depository ships. 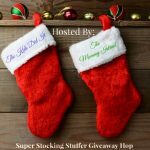 Just fill out the rafflecopter below for your chance to win. And for more bookish Midwinter celebrations, be sure to check out the other stops on the hop! With a cup of hot chocolate! I like to drink a latte in a pre-warmed cup. We don’t have much of a winter down south where I’m at. But if it does get cold I cuddle up to my husband and stick my feet under him to stay warm. And I usually have a book too. I like to cover up with several blankets and snuggle with my babies. A nice cup of Hot Chocolate and cuddling. With a nice hot chocolate! I love my electric blanket. I turn it on high about 30 minutes before I go to bed, It is nice and toasty when I get in it. With some hot cocoa and a good book! I warm up with a nice throw and a cup of hot tea. Love to curl up with my boyfriend in bed with our big warm blanket, watching tv!! With my dog in my lap under a fuzzy blanket on the coach while reading 🙂 thanks for the fun giveaway! How do you like to warm up on long winter nights? Hot Chai with a great book. Hot chocolate by the fireplace with a book! Drink hot chocolate on the couch while reading a book. With lots and lots of blankets and a good book! With Coffee and a book! Coffee and books keep me warm. 😉 Thanks for the giveaway. Cuddling with my husband and hot drinks. I like to grab a warm fuzzy blanket and drink hot cocoa. 🙂 Thanks for the giveaway! I live in the South and it hardly ever gets cold here. So when it gets even a little bit cooler I have my window wide open with a fan in the window. I haven’t seen snow it probably 25 years. I miss it! Thank you for the lovely giveaway. Some cuddle time with my husband, with soft blankets and all the fur kids. I like to curl up with a nice warm blanket. I like to curl up next to the fireplace with a good book! I love reading anything and everything whenever!!!! I like to warm up by sitting at the fireplace. On the couch or bed snuggled up with a blanket, hot tea and a great book. I warm up with a great book in a hot bath. I like to drink hot chocolate and stay under the blankets. I warm up under my two comforters on my bed with my book! I like a nice mug of hot chocolate, to be curled under a blanket and to have a good book in my hands. Thanks so much for the giveaway. I’d do something ridiculous like wear a tank top and shorts, then say, “I’m cold”, and wrap myself in my pink robe. I usually have a bunch of blankets with me, and either be watching TV shows/movies or reading a book. A cup of hot chocolate and a good book! A cup of hot tea and a snuggly blanket are a great way to warm up. Cuddle up with my boyfriend and some hot chocolate! when in the city just the old boring heater and blanket’s! but when i visit my parent’s i have a glorious fireplace i like to snuggle near!!!! Comforter & tea. I’m currently catless, but they should be in the mix, too. A glass of wine and a nice book. Laying on the sofa with books and a nice warm drink. I’m a great fan of electric blankets on long winter nights. Snuggle under a thick afghan with a cup of hot tea with lemon and sugar and of course, a good book! I like to get a fleece blanket and a mug of hot chocolate. I grab a cup of coffee, a blanket and a great book! I warm up with several blankets and a good book or favorite movie. I love keeping warm with fuzzy socks! A cup of hot tea and a good book. Merry Christmas!! I like to wear a warm sweater and drink some hot cocoa. Cuddling up with my husband and all three of our furbabies, in front of a roaring fire. Real wood not gas! Thank you for the giveaway! Merry, Merry Christmas!! With a nice warm blanket! It doesn’t matter where I am in the house, I’ll wrap a fleece blanket around me and walk around with it if I have to! Wearing a a thick pair of socks and curling up with a book and a mug of hot chocolate. Happy Holidays. I warm up with a good book and hot cocoa! Hot cocoa, Fuzzy socks and warm jammies. with hot chocolate and my dog! thanks! I like to sit in front of the fire with a glass of wine and a good book. Lay on my blanket covered chaise with a cat or two and a good book. I like to cuddle up with my husband and daughter with a nice warm blanket. I like to have a hot shower, dress in my thick pj’s and get under my soft blanket with an ebook to read. I live in Florida, so there’s not many cold winter nights. I have my AC on as I type this. It’s suppose to be 80 degrees on Christmas day. I love to light up the fireplace, have hot cocoa for kids and hot coffee for me and play cards! My sis-in-law gave us this great camel hair blanket she found when vacationing in South America some years ago, it is great for staying warm! I live in South Dakota so it really windy and cold a lot of the time. When it’s blistering cold outside at night and I want to stay warm I snuggle up with my husband, 2 dogs, a hot beverage and a good book. I like to cuddle up on my couch with hot coffee, my dog, and a blanket. It doesn’t really get that cold here. When it does dip, it’s mostly turn up the heat and wrap up in my favorite sweater. I like snuggling under the covers and drinking a hot cup of cocoa while enjoying my movies. I like to take a hot bubble bath and drink hot chocolate. I snuggle in bed, my favorite spot, with a warm drink and a good book/movie/TV show. I like to snuggle under a blanket on the couch with my two little dogs and have a cup of hot chocolate! I love fleece blankets and hot chocolate! I like to snuggle up with my pooches to keep warm. My heated throw and a big cup of coffee. Lots of blankets and if it’s really cold, a hot water bottle. I like to curl up on my bed with a good book! I like to drink hot cocoa or tea. With a blanket a cup of hot chocolate by the wood stove, reading a good book. I like a blanket and a glass of wine. With a cup of tea and my kitties. A hot cup of tea, a good book and a cat on my lap. I like to curl up with a good book, a blanket and a nice hot cup of chai! I like to sit by the fire with a cup of tea. I make a cozy nest on my bed, wear comfy jammies and fuzzy socks. With some vegan hot cocoa and a fuzzy blanket. I like to cozy up with tea and a good book. Pingback: The Sunday Post AKA What’s on my (Mostly Virtual) Nightstand 12-27-15 – Escape Reality, Read Fiction! We have an amazing fireplace to cozy up against – nothing like curling up with a good book in front of the fire. I love snuggling up and watching movies or reading! Reading on the beach (I live in Florida). I live in Florida so we don’t really have cold night. 🙂 But I love taking a warm bath with a good book! I soak in a hot bubble bath with a good book. Cuddling is the only way to warm me up haha! Thanks for the giveaway! Reading a great book with a cozy blanket and hot chocolate. Hot chocolate, with a cozy blanket and my dog snuggling my feet. With lots and lots of hot tea! When it is cold and dreary, I love a great cup of hot chocolate a great medical mystery book and my lap blanket and a quiet house and just resting on the couch..
With coffee or hot chocolate! I like warming up with hot chocolate and marshmellows! I like to cuddle with my hubby and a nice glass of wine. I put on a shirt then a sweatshirt and cover myself with blankets. I cozy up with my husband under a warm blanket. I like snuggling by the fireplace with coffee! No winter here, but hot chocolate, warm blankets (aka my dogs), and a good read are my trusty companions in the rare cold nights. Curled up by the fire with a cup of Joe, my reading socks on, and of course a book! Happy holidays. I love reading in bed with a cat next to me and my electric blanket on! Lots of blankets and some hot tea. Making a Chocochino with a marshamallow and getting my kitten to sleep on my lap! I cuddle up in bed with my cat, a book and a cup of chai tea. I like to warm up by sitting near the fireplace with a cup of hot chocolate. Mmm…cuddling up with a fuzzy blanket! We cuddle on the couch with an electric blanket. With a bottle of Canadian Club and good Horror Movie. With my Doctor who blanket, my husband next to me and my cat on my lap! Of course a book has to be in my hand! I warm up with a cup of hot tea, a furbaby or two and a good book. Drinking hot chocolate and curling up in a blanket with a book. I love my electric blanket in bed with a great book! I enjoy snuggling with hubby and watching movies to warm up on cold winter nights. It’s not that cold where I live but I like to cuddle up with my dogs, a good book and cup of coffee/hot chocolate. Blankets and warm clothes. Also hot chocolate and tea. Thanks for the great giveaway! Tee! Tee always does the job! I like to warm up by sitting in front of the fireplace with hot chocolate. If I’m really cold, I crawl in bed and turn my electric blanket on. a warm blanket and a great book.maybe some hot tea as well. I like to snuggle under the covers, drink a cup of hot chocolate, and watch movies. Curled up on the couch with a cup of hot cocoa. A cup of hot chocolate is my usual go to. Warm blankets, hot chocolate and thick socks! Thanks! Wrapped up in a soft, warm blanket with a good book! Thank you! with hot cocoa, lots of blankets and pillows, and a good book! With a nice hot cup of tea and a super soft blanket! When I’m cold, my electric blanket is my best buddy. I like to have a thick warm housecoat and a book with tea or coffee. By snuggling with my sweet hubby! Thanks and God bless! I love drinking hot chocolate. A nice warm throw and my dogs keep me warm. I like to warm up with a nice cup of coffee.